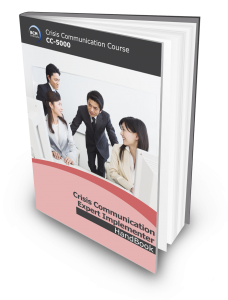 CC-5000 is a comprehensive Crisis Communication (CC) course that takes the participant from fundamental principles and concepts to advanced management techniques. It includes a three and half hour 150-Multiple Choice Question (MCQ) based examination, following the successful completion of a 4 Day classroom training. It is the institute’s most comprehensive crisis communication course for those who are new to crisis communication or who simply want to extend themselves in their crisis communication professional career. The course curriculum will enable participants to get a thorough understanding of the BCM Body of Knowledge with its 7 competencies for crisis communication practitioners, the globally recognised methodology for implementation and maintenance of crisis communication programs. On completion of the course, participants are expected to have acquired the skills and understanding to drive complex crisis communication projects and programmes for their organisation. CC-5000 will also introduce the essential steps in developing crisis communication strategies and implementing plans, preparing and conducting awareness and training programmes. Participants will acquire the skills and knowledge in project management, risk analysis and review, crisis communication strategy and plan development, testing and exercising, and programme management. This workshop is also designed for both novice and advanced professionals from the Business Continuity Management (BCM), Crisis Management (CM) and/or IT Disaster Recovery (DR) professional areas, who have a high degree of exposure to crisis communication. CC Certified Expert (CCCE) Certification will be awarded to participants who successfully completed and passed the Qualifying CCCE examination attached to the course, sends in an application detailing at least 3 year of CC experience , make the application processing fee payment of SGD150 and satisfies and meets the experience requirements of the independent certification body. Have a good overview of the crisis communication (CC) definitions and its relationship to BCM, CM and DR. Understand the key element of the CC framework. Understand the implementation objectives, activities and key deliverables for each stage of the CC planning methodology. Initiate and implement a CC program. Identify and assemble the CC team members. Assign the roles and responsibilities for each of the CC team member. Identify audiences, stakeholders and interested parties. Consolidate and analyse the list of crises for Executive Management’s approval. Identify and develop the relevant CC strategies. Develop media handling techniques and plan. Develop and implement press release and holding statements. Drive organisational-wide crisis communication programmes. Adopt a CC for social media during crisis. Learn how to develop an organization-wide CC awareness, training exercising and testing program. Implement audit and assessment program to ensure CC plan effectiveness. BC Managers, Organization BCM Coordinators and Practitioners tasked to drive large and complex corporate level CC programmes will reap maximum benefits from the concepts and practices. Experienced professionals with 3 years or more experience, from the security, risk management, facility, IT security, business operations who have direct or indirect responsibilities are encouraged to apply for their Crisis Communications Certified Expert (CCCE) certification. This course incorporates a 150-Multiple Choice Question electronic exam the next day. The duration of the examination is 3 and 1/2 hour. Candidates who achieve with a passing score of 75% or higher are eligible to apply for the BCM Institute’s Crisis Communications Certified Expert (CCCE) accreditation. The examination fee is included as part of the course fee. This course fee does not include application processing fee for the CCCE certification. The course fee includes the CCCE examination fee.